A Kentucky Derby Week that established records on several fronts and headlined by a victory in the “Run for the Roses” that launched unbeaten Justify’s run to a Triple Crown provided a strong start to Churchill Downs Racetrack’s 2018 Spring Meet that concluded its successful 38-day run on Saturday, June 30. Along with Justify’s unforgettable performance at rain-soaked Churchill Downs in the 144th running of the $2 million Kentucky Derby Presented by Woodford Reserve (Grade I), the brightest stars of the Spring Meet included $1 million Longines Kentucky Oaks (GI) winner Monomoy Girl, who is trained by Louisville-born Brad Cox; Hall of Fame trainer Bill Mott’s Old Forester Turf Classic (GI) winner Yoshida (JPN); and Pavel, winner of the $500,000 Stephen Foster Handicap Presented by GE Appliances (GI) for the team of Reddam Racing LLC, trainer Doug O’Neill and jockey Mario Gutierrez – a trio that combined to win Kentucky Derbys in 2012 with I’ll Have Another and Nyquist in 2016. 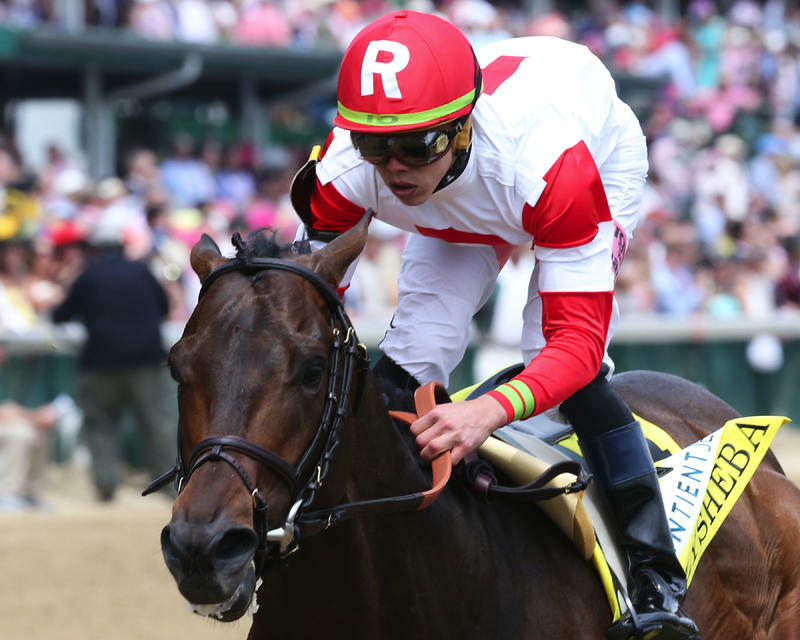 The racing meet that began with the “Opening Night” celebration on Saturday, April 28 was topped by the six days of Kentucky Derby Week that generated record wagering and attendance despite historic rainfall on Kentucky Derby Day on Saturday, May 5. The meet also encountered challenges in the introduction and implementation of a new parking and transportation system created in an ongoing $32 million project and a run of unseasonably warm weather toward the end of the racing and entertainment session. But the momentum of Derby Week continued through the 38-day racing session with a roster of special events headed by its three renewals of “Downs After Dark” night racing, Twilight Thursday racing and the popular Family Fun Days Presented by Kroger. And the track’s horsemen benefited from enthusiastic wagering and attendance during Derby Week that prompted a 10-percent boost to daily purses for overnight races during the final 19 racing days of the meet. “Churchill Downs deeply appreciates all who contributed to a remarkable Spring Meet that succeeded despite major changes in our track’s parking and transportation systems that were introduced during the biggest week in our industry, and hurdles from Mother Nature, which provided a rain-soaked Kentucky Derby Day unlike any other in the 145-year history of the event and our historic track,” said Kevin Flanery, president of Churchill Downs Racetrack. “We are grateful the fans who visited Churchill Downs for the Kentucky Derby and Oaks and throughout the meet, those who supported our racing product online via TwinSpires.com and other online wagering platforms, the horsemen and jockeys who competed in our high-quality daily racing program, the devoted members of our racetrack team and all in the community who contributed to the meet’s success. The just-concluded session was the first of three racing meets in a year that will include the return of the Breeders’ Cup World Championships to the Louisville track for a record-equaling ninth time on Nov. 2-3. Racing will resume at Churchill Downs for the Sept. 14-30 September Meet. The Fall Meet, which will include the two days of Breeders’ Cup competition, is scheduled for Oct. 28-Nov. 25. 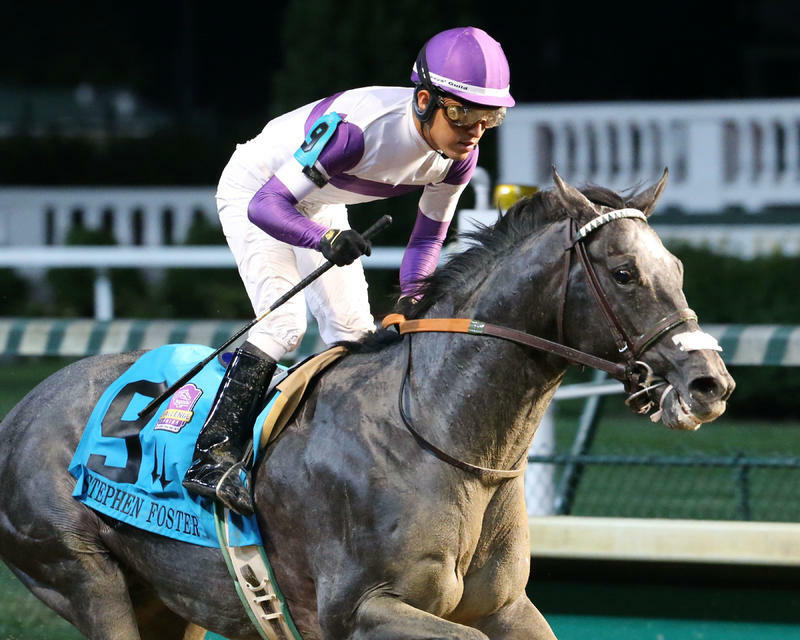 The Kentucky Derby victory by WinStar Farm, China Horse Club, Starlight Racing and Head of Plains Partners’ Justify under two-time Derby-winning Hall of Fame jockey Mike Smith was the highlight of the Spring Meet. 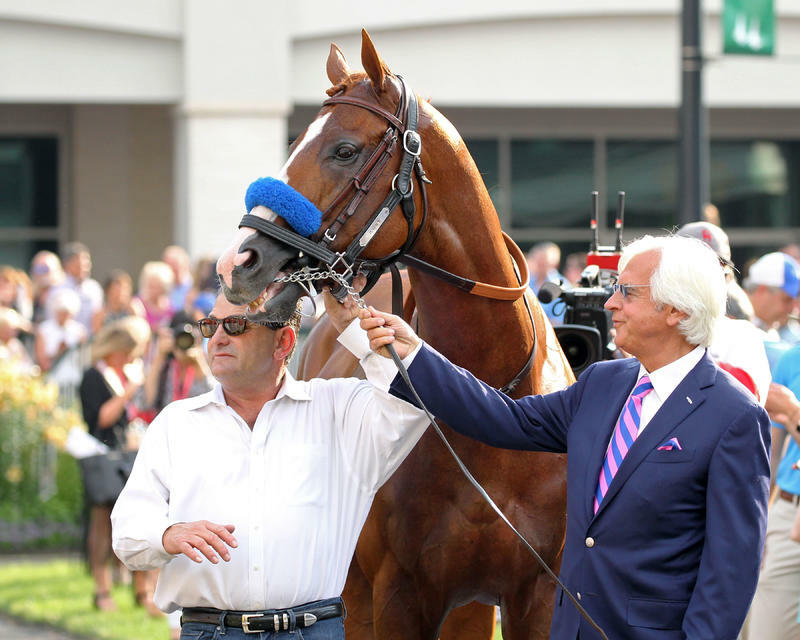 It provided Hall of Fame trainer Bob Baffert with a fifth victory in the race on a Derby Day unlike any other in the history of the race that was first run in 1875. 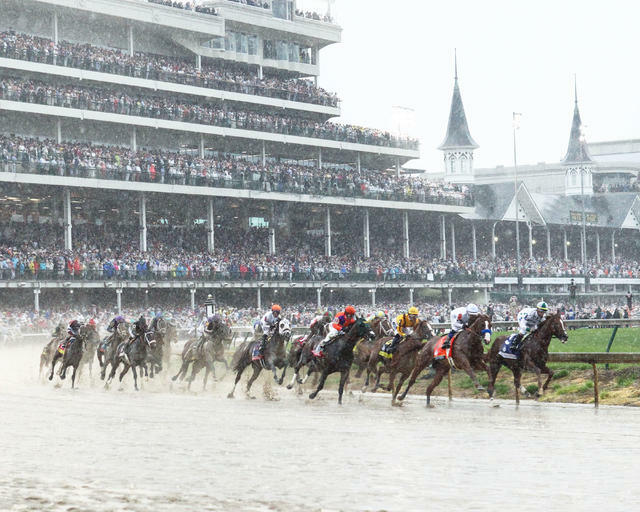 A record 3.15 inches of rain was recorded on Saturday, May 5 by the National Weather Service at nearby Louisville International Airport – a total that surpassed the previous Kentucky Derby Day record of 2.31 inches set on May 11, 1918. Of this year’s record rainfall, 1.83 inches fell from 3-4 p.m. – just hours before Justify won the Derby over a sloppy track. 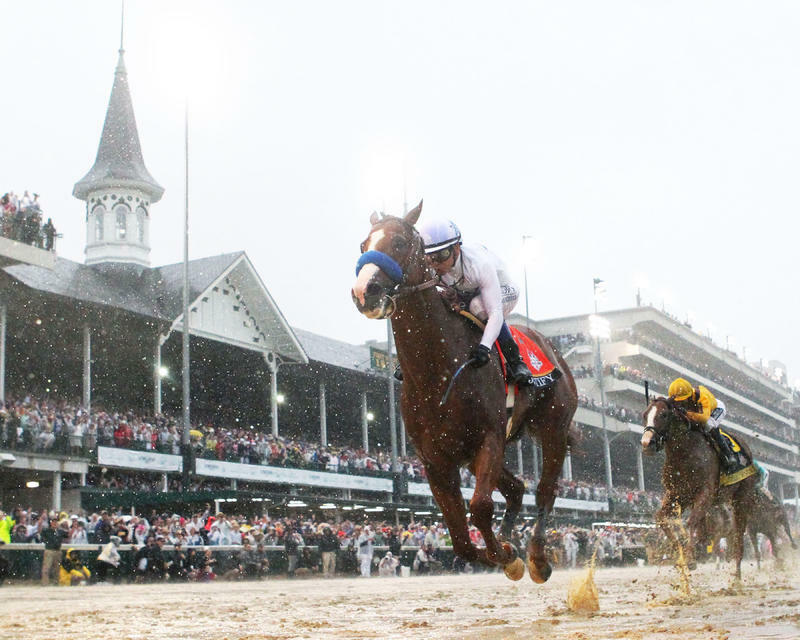 Despite the unprecedented rainfall, on-track attendance for Kentucky Derby Day at Churchill Downs was 157,813 – the eighth-largest crowd in track history – and record all-sources wagering totals were recorded for both the Kentucky Day program and the Kentucky Derby race. Wagering from all-sources on the Kentucky Derby Day program totaled $225.7 million, an increase of 8 percent over the 2017 total and previous record of $209.2 million. Wagering from all-sources on the Kentucky Derby race increased 8 percent to $149.9 million from the previous record of $139.2 million established in 2017. One day earlier a Kentucky Oaks Day crowd of 113,510 – the fifth-largest in history – cheered as Michael Dubb, Sol Kumin’s Monomoy Stables LLC, Stuart Grant’s The Elkstone Group LLC and Michael Caruso’s Bethlehem Stables’ Monomoy Girl and jockey Florent Geroux, won America’s premier race for 3-year-old fillies. 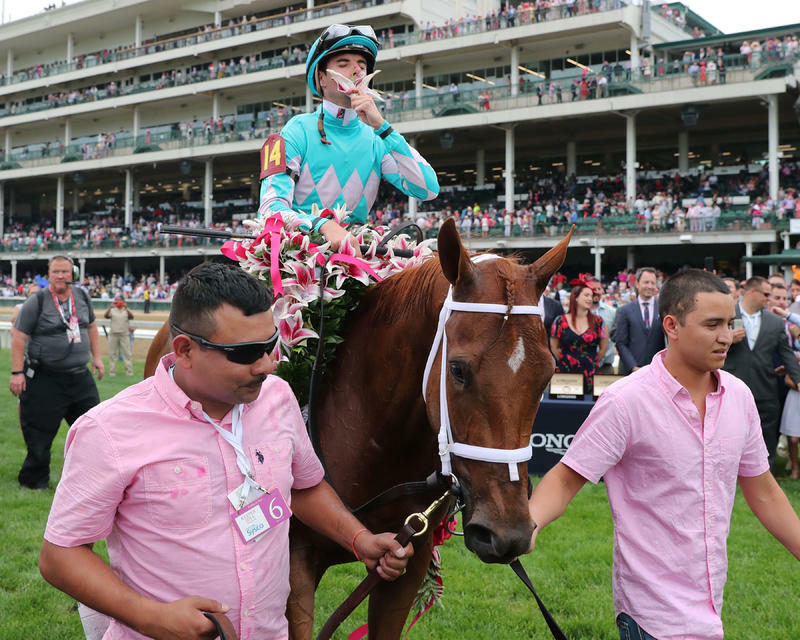 Wagering from all-sources on the full Kentucky Oaks Day race card totaled $55.8 million, a 14-percent increase over both the 2017 total of $48.9 million and the previous wagering record of $49.0 million set in 2016. All-sources wagering on the Kentucky Oaks race rose 18 percent to $17.5 million from 2017’s total of $14.9 million and increased 16 percent over the previous Oaks race record of $15.2 million in 2015. Wagering on the six racing days of Kentucky Derby Week totaled $311.2 million – an increase of 9 percent from the previous record established in 2017. Attendance during the week was 375,346, an increase of 7 percent from 2017. The opening week attendance total included record crowd of 48,134 that enjoyed the celebration of Thurby on Thursday, May 3. “Downs After Dark” racing under the lights remained a popular attraction during the Spring Meet with total attendance of 60,144 for the meet’s trio of night racing celebrations. The largest of those events were Opening Night, which included the third annual “Awards in the Arts” celebration, and the June 16 program that included five stakes races topped by the Stephen Foster Handicap and the first on-track appearance by Kentucky Derby and Triple Crown winner Justify following his historic sweep of the Derby, Preakness (GI) and Belmont Stakes (GI). Owner Kenny Troutt of majority owner WinStar Farm and other partners accepted the engraved solid gold Kentucky Derby Winner’s Trophy after Justify paraded before the fans and made stops in the paddock and Woodford Reserve Winner’s Circle. Accepting engraved solid silver winner’s trophies during the festivities were Baffert, Smith and Tanya Gunther of Glennwood Farm, who accepted the winning breeder trophy for her father, John Gunther. Race purses paid during the Spring Meet totaled $22.2 million, which reflected an increase of 4.5 percent over the $21.3 million total from 2017. Average daily races purses totaled $584,829 and the average race purse rose to $59,741. Both totals reflect a 4.5-percent increase from the previous year’s Spring Meet. The number of horses that competed in Spring Meet races and the average size of a daily race field dipped slightly in the just-completed session. A total of 2,894 horses competed in 372 races run during the meet’s 38 days and the average size of a race field during the meet was 7.8 horses. The numbers reflect a 3.4-percent decrease from the 2017 average field size of 8.1 and 2,997 total starters for the same number of Spring Meet races. Records were extended by the winners of the meet’s races for leading trainer and leading owner, but the champion rider of the Spring Meet earned that honor for the first time. 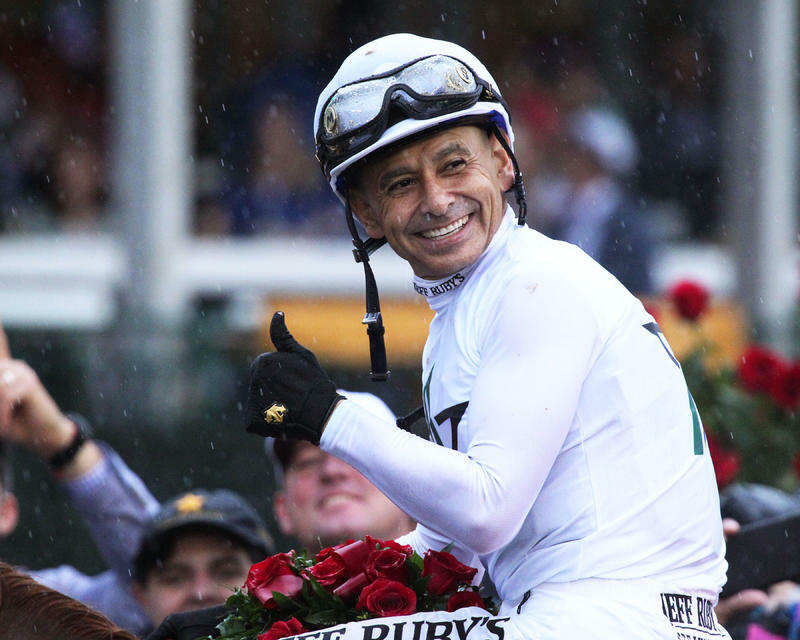 Brian Hernandez Jr. guided 43 horses to the Woodford Reserve Winner’s Circle to earn his first leading jockey title at Churchill Downs since he arrived at the Louisville track in 2004. 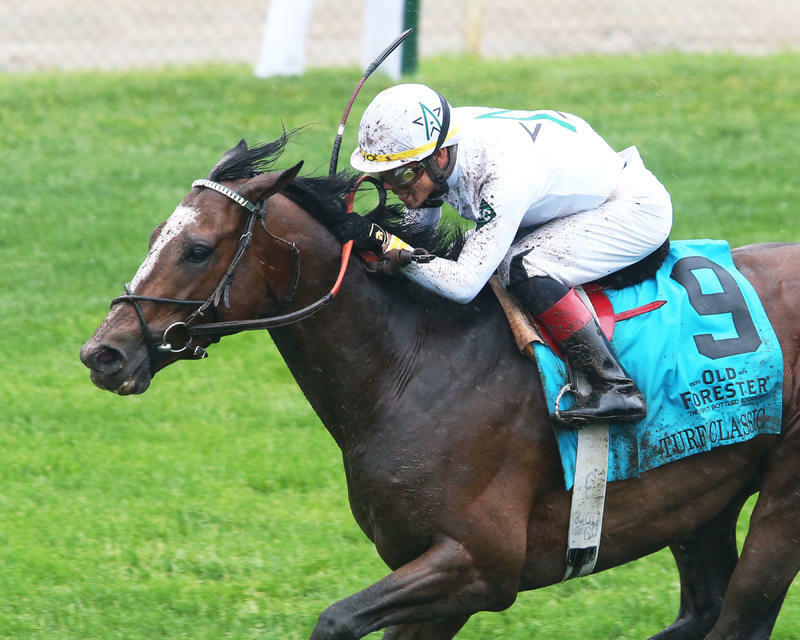 The victory total by the 32-year-old Hernandez included wins aboard Three Chimneys Farm LLC and Fern Circle Stables’ 2-year-old filly Restless Rider in the $100,000 Debutante (Listed) on the meet’s closing day and a Kentucky Derby Day triumph aboard Calumet Farm’s Funny Duck in the $300,000 Pat Day Mile Presented by LG&E and KU (GIII). Geroux finished second among Spring Meet jockeys with 38 wins. Included in Geroux’s total was a meet-high five stakes victories topped by his Kentucky Oaks win aboard Monomoy Girl. Corey Lanerie, a 15-time riding champion at Churchill Downs, finished in third place with 35 wins. 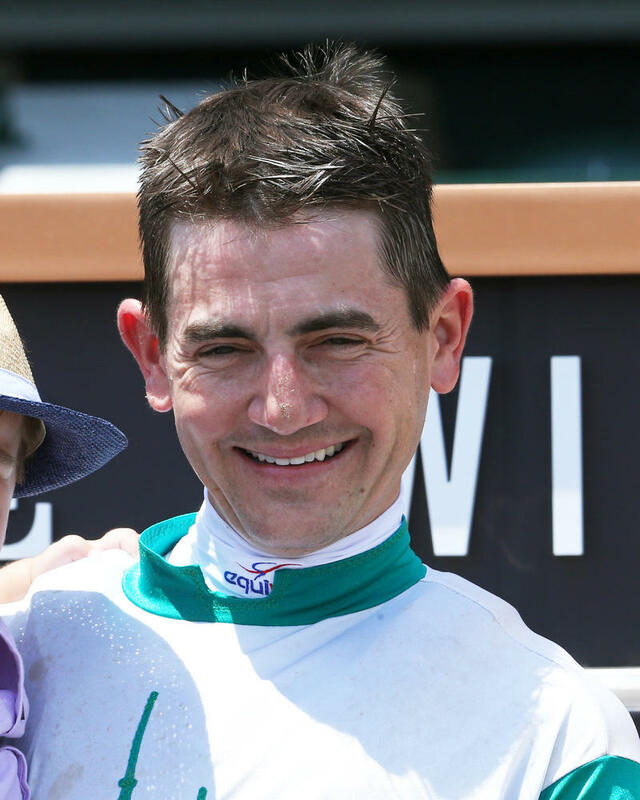 Lanerie missed the meet’s final seven racing days following the sudden death of his wife, Shantel, on June 22. Ricardo Santana Jr. earned 30 wins and Julien Leparoux and Shaun Bridgmohan finished in a tie for fifth with 26 wins. Lanerie won five races on Saturday, May 12 for the best one-day performance by a jockey during the Spring Meet. Hernandez earned four wins on the Twilight Racing program on Thursday, May 10. Edgar Morales was the meet’s top apprentice jockey. The 20-year-old native of Puerto Rico earned 15 wins and tied for eighth in the overall standings. 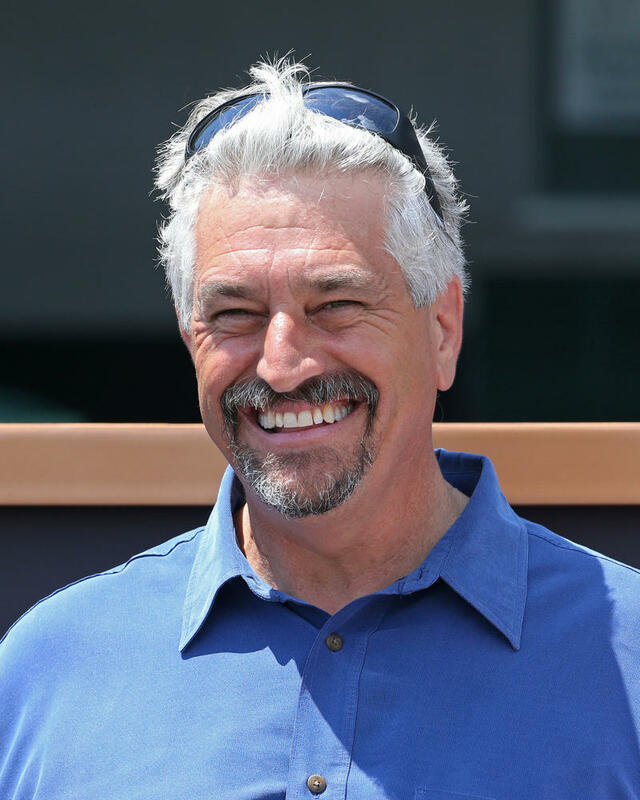 Hall of Fame trainer Steve Asmussen extended his record total of leading trainer championships at Churchill Downs to 19 with 30 winners that included a record-equaling fifth win in the $100,000 Bashford Manor (GIII) with Whispering Oaks Farm LLC’s Sir Truebadour on closing day. The victory was one of 10 Spring Meet wins by 2-year-olds saddled by Asmussen. 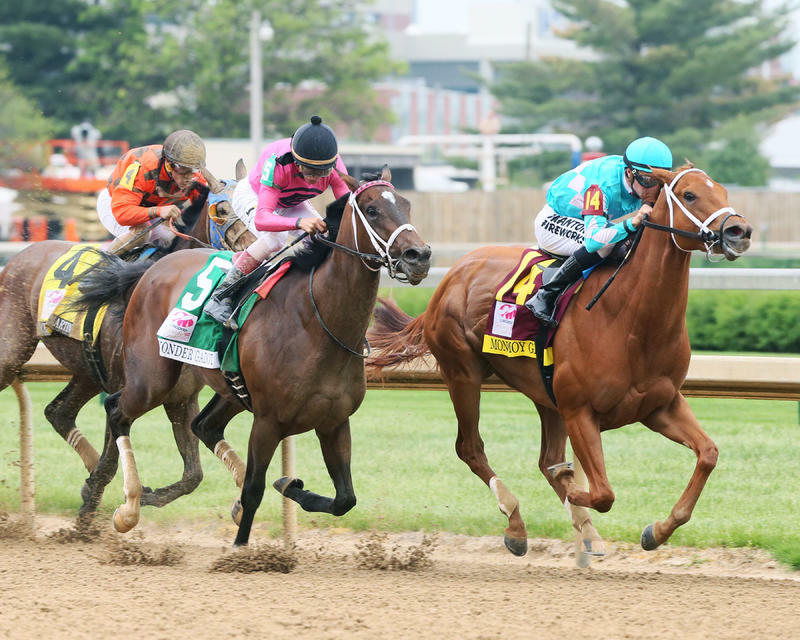 Another meet highlight for Asmussen was a stakes win on Kentucky Oaks Day in the $200,000 Eight Belles Presented by Kentucky Trailer (GII) with Heiligbrodt, Heiligbrodt, Heider Family Stables LLC and Madaket Stables LLC’s Mia Mischief. Cox finished second in the leading trainer race with 24 wins, but his Kentucky Oaks victory with Monomoy Girl, Wise Dan (GII) triumph with Mr. Misunderstood, Regret (GIII) win with Beyond Blame and Twin Spires Turf Sprint Presented by TwinSpires.com (GIII) victory with Will Call were among his five stakes wins during the meet, the top total among all trainers. Ian Wilkes saddled 19 winners to finish third, while Kenny McPeek and Eddie Kenneally rounded out the top five with 16 wins each. McPeek’s total included stakes wins by Restless Rider in the Debutante and Vettori Kin (BRZ) in the $100,000 Louisville Handicap (GIII). Ken and Sarah Ramsey, the all-time leading owners at Churchill Downs, won nine races to earn their record-extending 31st leading owner title at Churchill Downs. The victory total by the Nicholasville, Ky. couple, who earned their first Churchill Downs title in 2000, was topped by a win by Backyard Heaven in the $400,000 Alysheba Presented by Sentient Jet (GII). Three owners – Whitham Thoroughbreds LLC, Gary and Mary West and Susan and Jim Hill – finished in a tie for second with four wins. Eleven owners tied for fifth at three wins apiece. Other Grade I stakes performances during the Spring Meet were the win by Gary Barber, Baccari Racing Stable and Chester Prince’s Salty over a field that included reigning Kentucky Oaks winner Abel Tasman in the $350,000 La Troienne Presented by TwinSpires.com on Kentucky Oaks Day, and the victory by Kaleem Shah’s homebred American Gal in the $300,000 Humana Distaff on Derby Day. Notable stakes performances during the Spring Meet included a second consecutive victory by Limousine Liberal in the Churchill Downs Presented by TwinSpires.com (GII); a victory by Blue Prize (ARG) in the Fleur de Lis Handicap (GII); a narrow win by Proctor’s Ledge in the Longines Churchill Distaff Turf Mile (GII); Maraud’s victory in the American Turf Presented by Ram Trucks (GII); Toinette’s upset of heavily favored Rushing Fall in the Edgewood Presented by Forcht Bank (GII); a romp by Chief Cicatriz in the Aristides (GIII) and Miss Kentucky’s victory in the Winning Colors (GIII).